Mandelic acid has been studied extensively and is specially formulated for its use in treating common skin problems such as photo-ageing, skin ageing, acne and pre and post preparation for laser resurfacing. They freshen up the face and can help to treat acne, rosacea, fine lines and wrinkles, photodamage, rough texture and ageing skin. The range is suitable for all skin types, (including skin with dark pigmentation). Trained members of the medical profession, and beauty therapists (NVQ3 level and above). Optimises and cleanses the skin before peeling. Removes grease and dead cells from the skin to avoid irregular peeling. Professional Mandelic Acid with Citric Acid and Tiolactic Acid. Profressional Mandelic Acid Peeling with Citric Acid for more sensitive skin. Restructuring, neutralising and normalising cream to be applied after each peeling. A unique cream for restructuring and normalising skin. Active gel with Mandelic Acid, when used in conjunction with Hydrata System accelerates good skin results. Thereafter another course of 6 peels should be taken in 6 months time. Those going on a course of Mandel peels should also be using the at-home Hydrata System morning and night for the first 3 days after peeling. From day 4, the Hydrata System product should be applied in the morning and the Mandel Active product in the evening until the next peeling session. According to the manufacturer there are no reported side effects. 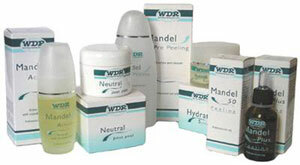 They also claim that unlike other peeling treatments on the market, Mandel can be used all year round without the necessity to stay out of the sun after treatment. This depends on area treated and how much is required, and the practitioner doing the treatment, but ranges are in the region of £40 to £70 per treatment session. Click for ALL Mandel Peels clinics in the UK & Ireland registered and verified by Consulting Room.